RV1 Guardian™ Tire Changer: Revolutionary Offering by Ranger! 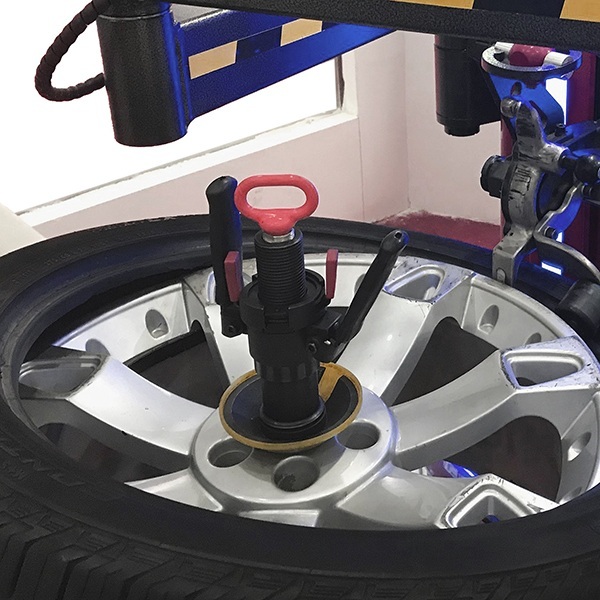 The Ranger RV1 Wheel Guardian features the latest in touchless wheel-service technology and provides your shop with the most advanced tire changing capabilities on the planet. You no longer need them those tire irons and levers, so put them away! The RV1 is a workhorse designed to work on all wheels types without damaging the rim or requiring clumsy toolbars, bead locks or tire levers. Why risk the chance of damaging expensive wheels when you can go touchless? 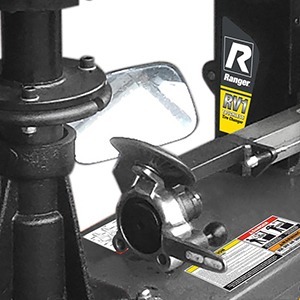 With the Ranger RV1 Wheel Guardian, tire irons and levers become a thing of the past. The unique reversible tool head effortlessly mounts and dismounts the most stubborn tires without ever making contact with the wheel. Ergonomic joystick control features with a precision actuator, allowing you to inch the bead hook or lifting tip into position for gentle handling of delicate alloy wheels. Take your pick: a durable nylon tool head or hardened steel tool head with replaceable nylon inserts. Both come standard, giving you the option to choose just the right tool to make those delicate services as simple as can be. The Ranger RV1 Wheel Guardian is a durable day-to-day performer with the flexibility to service a wide variety of wheels, including OEM configurations, run-flats and exotic performance wheels, with ease. The full menu of time-saving features includes automatically operated bead breaker rollers that offer controlled penetration and loads of power; a power-assist traveling drop-center arm; and a power-drop assist roller that allows you to change virtually anything, even difficult run-flats and low-profile tires, with minimal effort and maximum efficiency. Whether you’re dealing with standard steel wheels or expensive custom alloys, you can tackle them any job with total confidence in your tire changer. An integrated wheel lift with easy-guide rollers helps facilitate the handling of heavy wheels and virtually eliminates operator injury. Techs of all experience levels will love using this machine! Tires are secured to the changer in the same manner as a wheel balancer for user familiarity and super-fast setup times. A rubber base mount, multi-size center cones and patented no-mar “Quick-Nut” make mounting wheels fast and easy, further reducing any risk of wheel damage. 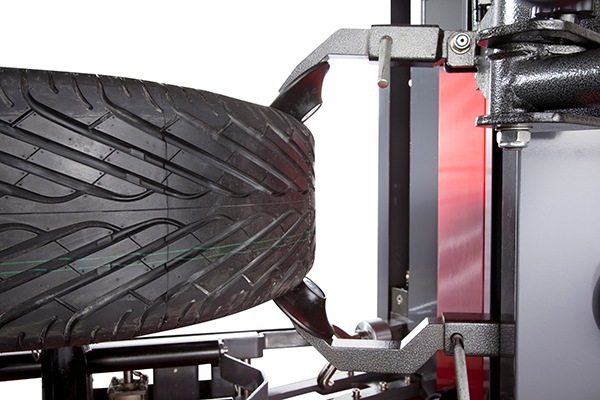 The Ranger RV1 Wheel Guardian tire machine provides an expanded service range on 13” – 30” rim diameters that are up to 15” wide, giving you the ability to work efficiently on a variety of wheel styles and sizes. 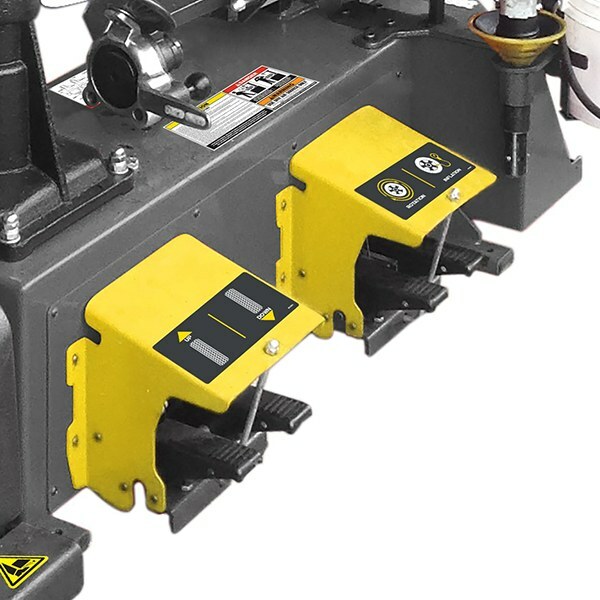 Automatically operated bead breaker rollers feature controlled penetration to easily loosen even the most stubborn and awkward beads. Ranger RimGuard™ Technology means expensive wheels are handled with greater care, resulting in less damage and increased work efficiency. 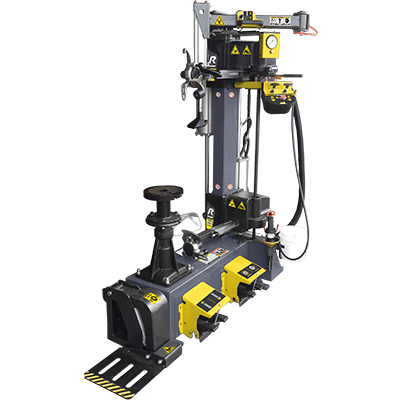 A single, automatically operated tool head mounts and demounts tires without touching the wheel or requiring levers of any kind. The RV1 comes standard with hardened steel tool head and Nylon inserts. 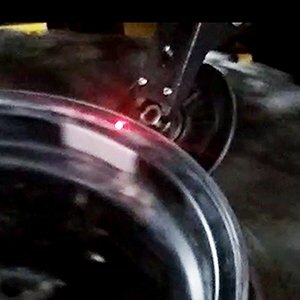 Our exclusive Target-Spot™ laser provides precise position-sensing data from the robotic upper bead roller, then generates the exact coordinates for the Target-Spot™ tool head, making underside bead-tool positioning easy. The RV1 features a wide-view mirror mounted low on the chassis that provides a full view of underside operations. 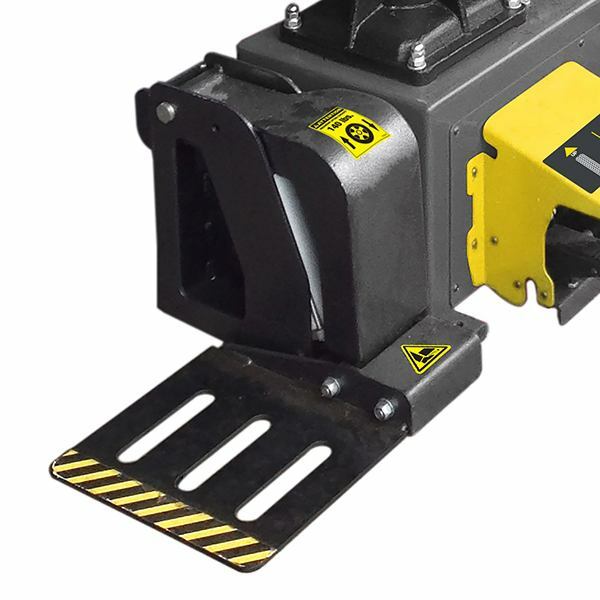 This touchless tire changer features conveniently placed foot pedals that give operators precise control at all times. The powerful turntable works systematically at a controlled speed for easy tire removal and installation. The smooth, effortless, power delivery of the 3 HP motor provides multi-speed install performance, even on tires with stubborn beads. Reversible direction offers operators the ability to back up in the event of turntable stall during stubborn bead installation. 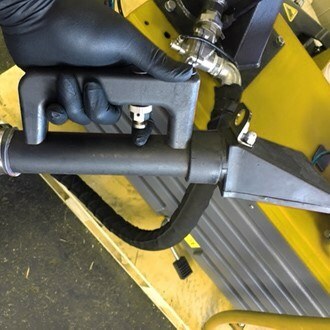 A handheld turbo-blast nozzle allows technicians to direct a powerful burst of compressed air precisely where needed to seat even the toughest stubborn beads in seconds. A simple slide valve requires two-hand operation to protect operators from accidental discharge. Integrated tire inflation system features air-surge pulse inflation for faster inflation speed and improved bead seating. A large, easy-to-read pressure gauge with built-in pressure limiter and air dump valve simplifies tire inflation. The RV1 features high precision foot pedal control valves capable of withstanding heavy use. 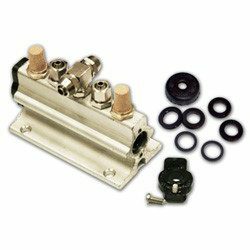 They feature aluminum-alloy valve bodies with durable, corrosion resistant stainless steel spools, combined with a high precision finish for maximum seal life. As added precaution, Ranger provides you with all the necessary tools to ensure wheel damage is minimized during wheel service operations. Our total-care package includes replaceable nylon inserts for the steel tool head, replaceable nylon remount and dismount heads, rubber pedestal cover, spare drop-center pull hook tool head and a no-mar Quick-Nut. When you purchase a performance tire changer, you should receive a performance tool package. We like to call our tooling package the Total Performance Package—with an added bonus. Not only do we give you our standard car and light truck cones, we include our heavy-duty truck cone, as well. Our Total Performance Package includes three automotive and light truck cones covering hub sizes 2.00 – 2.75, 2.75 – 4.00 and 4.00 – 6.00, as well as one heavy-duty truck cone that fits hub sizes 5.50 – 6.50. As the world’s premier manufacturer of automotive service products, we take environmental concerns very seriously. We engineer our products to work great and offer tremendous value, but we also design them in a way that reduces energy consumption and greenhouse gases. As part of our ongoing “think-green” initiatives, the RV1 features Auto-Shutdown Technology, which switches off key power system components after 15 seconds of inactivity. This proprietary power-saving technology shuts off the pump and motor when the machine is at idle, representing tremendous savings in energy-use and minimizing wear and tear on critical operating components. Auto-Shutdown Technology also reduces background noise, creating a more environmentally responsible workplace.